Hard on the heels of commitment comes another interesting, small social dynamics model on Arxiv. This one’s about the dynamics of the Arab Spring. The self-immolation of Mohamed Bouazizi on December 17, 2011 in the small Tunisian city of Sidi Bouzid, set off a sequence of events culminating in the revolutions of the Arab Spring. It is widely believed that the Internet and social media played a critical role in the growth and success of protests that led to the downfall of the regimes in Egypt and Tunisia. However, the precise mechanisms by which these new media affected the course of events remain unclear. 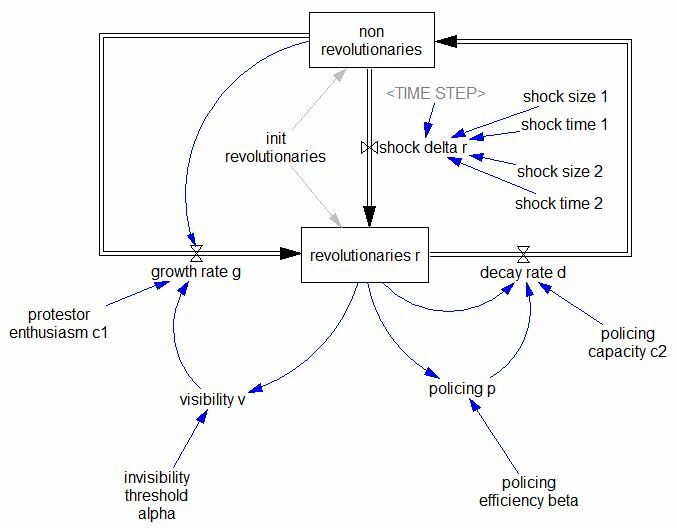 We introduce a simple compartmental model for the dynamics of a revolution in a dictatorial regime such as Tunisia or Egypt which takes into account the role of the Internet and social media. An elementary mathematical analysis of the model identifies four main parameter regions: stable police state, meta-stable police state, unstable police state, and failed state. We illustrate how these regions capture, at least qualitatively, a wide range of scenarios observed in the context of revolutionary movements by considering the revolutions in Tunisia and Egypt, as well as the situation in Iran, China, and Somalia, as case studies. We pose four questions about the dynamics of the Arab Spring revolutions and formulate answers informed by the model. We conclude with some possible directions for future work. The model has two levels, but since non revolutionaries = 1 – revolutionaries, they’re not independent, so it’s effectively first order. This permits thorough analytical exploration of the dynamics. This model differs from typical SD practice in that the formulations for visibility and policing use simple discrete logic – policing either works or it doesn’t, for example. There are also no explicit perception processes or delays. This keeps things simple for analysis, but also makes the behavior somewhat bang-bang. An interesting extension of this model would be to explore more operational, behavioral decision rules. The model can be used as is to replicate the experiments in Figs. 8 & 9. Further experiments in the paper – including parameter changes that reflect social media – should also be replicable, but would take a little extra structure or Synthesim overrides. This model runs with any recent Vensim version. I’d especially welcome comments on the model and analysis from people who know the history of events better than I do. still works, though with a bit of noise from general SD society pages. “And there’s another thing,” I went on. “Yes,” said he. “Your way of approaching the problem. They’re specialists, the whole lot of them, and they don’t believe in a method of work which cuts into every field of science from botany to archaeology. They limit their own scope in order to be able to dig in the depths with more concentration for details. Modern research demands that every special branch shall dig in its own hole. It’s not usual for anyone to sort out what comes up out of the holes and try to put it all together. Carl was right. But to solve the problems of the Pacific without throwing light on them from all sides was, it seemed to me, like doing a puzzle and only using the pieces of one color. This reminds me of a few of my consulting experiences, in which large firms’ departments jealously guarded their data, making global understanding or optimization impossible. This is also common in public policy domains. There’s typically an abundance of micro research that doesn’t add up to much, because no one has bothered to build the corresponding macro theory, or to target the micro work at the questions you need to answer to build an integrative model. An example: I’ve been working on STEM workforce issues – for DOE five years ago, and lately for another agency. There are a few integrated models of workforce dynamics – we built several, the BHEF has one, and I’ve heard of efforts at several aerospace firms and agencies like NIH and NASA. But the vast majority of education research we’ve been able to find is either macro correlation studies (not much causal theory, hard to operationalize for decision making) or micro examination of a zillion factors, some of which must really matter, but in a piecemeal approach that makes them impossible to integrate. An integrated model needs three things: what, how, and why. The “what” is the state of the system – stocks of students, workers, teachers, etc. in each part of the system. Typically this is readily available – Census, NSF and AAAS do a good job of curating such data. The “how” is the flows that change the state. There’s not as much data on this, but at least there’s good tracking of graduation rates in various fields, and the flows actually integrate to the stocks. Outside the educational system, it’s tough to understand the matrix of flows among fields and economic sectors, and surprisingly difficult even to get decent measurements of attrition from a single organization’s personnel records. The glaring omission is the “why” – the decision points that govern the aggregate flows. Why do kids drop out of science? What attracts engineers to government service, or the finance sector, or leads them to retire at a given age? I’m sure there are lots of researchers who know a lot about these questions in small spheres, but there’s almost nothing about the “why” questions that’s usable in an integrated model. I think the current situation is a result of practicality rather than a fundamental philosophical preference for analysis over synthesis. It’s just easier to create, fund and execute standalone micro research than it is to build integrated models. The bad news is that vast amounts of detailed knowledge goes to waste because it can’t be put into a framework that supports better decisions. The good news is that, for people who are inclined to tackle big problems with integrated models, there’s lots of material to work with and a high return to answering the key questions in a way that informs policy.